Over the next few weeks, Equity Blog will feature posts about the newly-released series of 13 issue briefs from PolicyLink and the Marguerite Casey Foundation. This series highlights the economic imperative of equity for the policy planks of the foundation’s Equal Voice Campaign National Family Platform. The recent policy brief from PolicyLink and the Marguerite Casey Foundation, Transportation for All: Good for Families, Communities, and the Economy, provides a compelling set of demographic and economic indicators that strengthen the case for an equity-led transportation policy agenda. The national level examples help reinforce the example that Urban Habitat and our allies in the 6 Wins for Social Equity Network made in the Bay Area’s 2013 regional planning process, known as Plan Bay Area. The 6 Wins Network developed a regional plan alternative, known as the Equity, Environment and Jobs scenario, which demonstrated a regional transportation, land use, and housing plan that starts with community-identified needs that produces the greatest range of co-benefits (greenhouse gas reductions, increased transit service, better air quality, less risk of displacement) for all communities. In the Bay Area, we’ve had strong success relative to the rest of the nation in passing local/county transportation funding measures. In November 2016, there will be another full slate of transportation measures in Silicon Valley San Francisco, and the East Bay. One of our strongest arguments in getting local officials on board to support transportation funding measures has been to demonstrate the nexus between quality job creation and transportation investments. However, we've still struggled to translate the job creation benefit data of shifting funds from highways to transit (and especially transit operations) into concrete changes in investment priorities. There’s still much education and advocacy work to be done on this front. Regionally in the current round of Plan Bay Area, 6 Wins Network members such as Working Partnerships USA and the San Mateo Union Community Alliance have led efforts to incorporate quality job creation into our campaign for equitable regional planning. This is a new effort to show how investments and programs in regional land use and transportation planning can be leveraged to create more middle wage jobs and address the “hour glass” economy that has developed in the Bay Area. 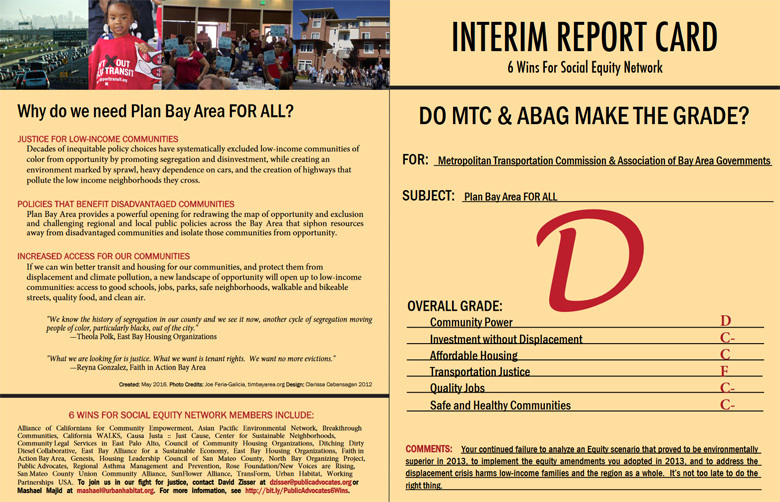 Urban Habitat, Public Advocates, and members of the 6 Wins for Social Equity Network have also just released a second “equity report card” on the regional planning scenarios for Plan Bay Area. We’ve continued to document and provide analysis on how inequitable regional planning disproportionately impacts low-income people and communities of color and fails to achieve regional and state climate change goals. The report card has been one of our most effective communications and policy analysis tools for highlighting the costs of inequitable regional planning both for the public and decision makers. In San Francisco, we’ve helped lead the development of MUNI’s transportation service equity strategy which provides a neighborhood level framework to help ensure that community identified transit service needs define investment priorities and that funding – especially new funding – is targeted to meet these needs in transit dependent communities. Transportation for All provides a framework for a lot of these issues and shows how targeted investments in equitable transportation can create more jobs than previous decades of highway construction have, while expanding access to opportunity to those communities that have not benefited from the current economic recovery. For more information on Urban Habitat, visit: www.urbanhabitat.org or follow them on Twitter @Urban_Habitat.